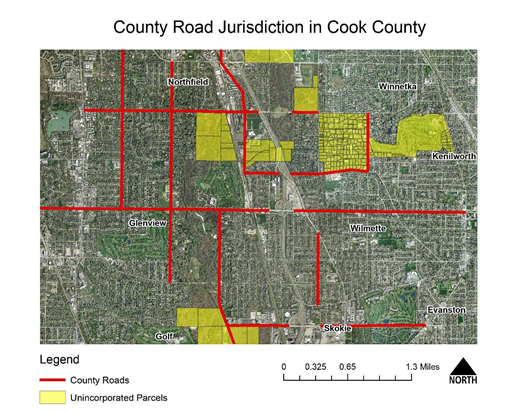 Cook County’s unincorporated areas account for 125.8 square miles, or 13.1% of the County’s total land area. (Of that land area, 60.26% is located within a forest preserve.) Residents of these areas rely on the County to provide municipal services such as law enforcement, building and zoning, and liquor control at a cost to the County of $37.2 million each year. A recent Civic Federation report profiles selected unincorporated areas. While their land area is not large, unincorporated parcels are scattered across the County, making it inefficient to administer them and to provide services to their residents. The geography of unincorporated Cook County means the County's building and zoning inspectors report spending most working hours in their cars because the properties they inspect are so spread out. Visit Cook County’s interactive CookViewer Map Application to see a display of how scattered unincorporated areas are. The aerial image below demonstrates one inefficiency influenced by unincorporated areas: road services. Under Illinois state law, townships, not the County, are responsible for the maintenance and repair of roads in unincorporated Cook County. However, the Cook County Department of Transportation and Highways is solely responsible for 26 centerline miles of county roads in which both sides of the roadway technically fall in an unincorporated area. In addition, the County shares responsibility for roughly 570 centerline miles with municipalities. This creates a discontiguous patchwork of road responsibilities between governments that lead to inconsistencies in services like pavement maintenance and snow removal. The image below helps discern between townships, municipalities and unincorporated areas when considering how governments divide responsibility for services like road maintenance. The yellow sections of unincorporated area fall into either Northfield or Maine Township, and many of those unincorporated areas border multiple municipalities within the township. The mix of jurisdiction contributes to discontiguous, inefficient services. The next aerial image shows unincorporated parcels adjacent to the Village of Glenview. Depending on which side of the street residents live on, and in some cases which part of the block they live on, municipal services are either provided by the Village of Glenview or by Cook County. The Cook County Sheriff's Office reports that 50.04% of the total FY2013 County police budget was spent policing unincorporated areas, which include just 126,114 of the County’s 5.2 million total residents. Reasons for these boundaries between municipalities and unincorporated areas vary widely, including inconsistences in infrastructure and variances in building codes that would need to be addressed if an unincorporated area were to be annexed to a neighboring municipality. Based on interviews conducted with a variety of stakeholders as part of its Unincorporated Cook County report, the Civic Federation was able to identify some of the problems that must be considered if incorporation is pursued as well as benefits that might accrue to residents and businesses in currently unincorporated areas. More on the problems and benefits of annexation can be read here.